The King in Yellow is a rather surreal collection of short stories by Robert W. Chambers published in 1895. The stories are scattered all over the map between horror and romance, but all generally have ties to France as a setting, the later ones moving more and more into romance and increasingly starring artists. A common thread is a fictional play also called The King in Yellow, the reading of which either drives people mad or leads them to a dark fate. Due to the publishing date, it's in the public domain in most countries and readable online. H. P. Lovecraft cited this book as an influence, and it's the directnote Chambers himself got it from a short story by Ambrose Bierce, "Haïta the Shepherd", in which it's just a shepherd's god source of Hastur's name. According to Lovecraft's friend and fellow writer August Derleth, the actual performance of The King in Yellow is a summoning ritual for an Eldritch Abomination. Several authors have crafted facsimiles of the "real" text of Chambers' fictional play, including playwright Thom Ryng's 1999 version, which premiered at the Capitol Theater in Olympia WA and has seen two printings from Armitage press. A particularly notable version was written by James Blish for the story "More Light". You might be looking for the Raymond Chandler short story of the same name (in which the lead refers to this book). Alien Sky: Carcosablack stars, twin suns, you name it. All First Person Narrators Write Like Novelists: Taken to a rather odd extreme when it turns out that the narrator of The Yellow Sign has been fatally wounded and is writing his account as he is dying. Anthropomorphic Personification: The Yellow King may personify decadence itself. That's what the colour yellow means (see the yellow book in The Picture of Dorian Gray). Artifact of Doom: Any copy of the play The King in Yellow. The subject matter of the play isn't entirely revealed, other than that it's set in "the lost city of Carcosa", perceived to be very artistically written, though the first act is tame and the second act drops hard. Reading the play will either lead to madness or a dark fate. The King in Yellow himself is never seen, nor shown whether or not he actually exists, though he appears to be a Humanoid Abomination that embodies decadence. Bilingual Bonus: There's a lot of untranslated French. Bright Is Not Good: Hastur. Brown Note: The eponymous fictional play. Don't read it! Also the Yellow Sign, which seems to leave the viewer susceptible to some kind of mind control if they've already read The King in Yellow. Driven to Suicide: "The Repairer of Reputations," "The Mask" and "The Yellow Sign"
During the War: "The Street of the First Shell"
Eldritch Location: The lost city of Carcosa, "where black stars hang in the heavens; where the shadows of men's thoughts lengthen in the afternoon, when the twin suns sink into the lake of Hali..."
Fictional Document: While referenced and quoted, the entire text of The King in Yellow is never set out. The main character of "The Yellow Sign", however, is both shocked and bewildered to see his girlfriend pull out the book out of his shelves; while he desperately and repeatedly tells her to put it down and not to open it, he's also wondering how the hell the book managed to end up in his apartment in the first place, as he is well aware how dangerous it is. Humanoid Abomination: This is one of the texts Lovecraft was inspired by, after all. 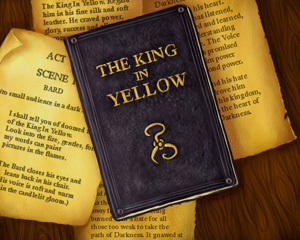 Notably, the King In Yellow himself is (seemingly) absent from the actual book, but he is the one that made the play named after him. Book covers (and many depictions, before and after the internet arrived) generally depict him as a humanish being wearing bright yellow robes. Mad God: The King in Yellow him/her/itself or as an inversion by making everyone crazy via the play. Masquerade Ball: "The Mask": Implied to occur in the play. "I wear no mask." Metafictional Title: The King in Yellow, the book, is named after The King in Yellow, the play. Mind Screw: "In the Court of the Dragon"; "The Prophets' Paradise"; "The Repairer of Reputations"; even the opening poem. Let's just say that of all the authors whose work is regarded as belonging to the "weird tales" genre, most aren't half as weird as Chambers. Noodle Incident: Mr. Scott's love affair with Sylvia ended with him concealing an unnamed secret within the forests of Brittany. Most portions of the play itself. Not a Mask: Played straight. Cassilda: Indeed, it's time. We all have laid aside disguise but you. Schmuck Bait: People keep reading The King in Yellow even if they've been informed doing so is a bad idea. There's a subtle implication that the play exerts some sort of One Ring-style influence on people to get itself read. Shout-Out: Chambers took the enigmatic names Hastur and Carcosa from two of Ambrose Bierce's short stories. A Shout-Out in the other direction occurs in Marion Zimmer Bradley's Darkover series, which uses lots of the names from the book — mostly for Darkovan mythical/historical characters, occasionally for places. Surreal Horror: Nothing about the horrific weirdness is explained. Ever. The Undead: "The Yellow Sign". It is linked to the eponymous play. What Happened to the Mouse? : Although the evil cat is killed (and that's not even a sure thing, given that Hildred's an Unreliable Narrator putting it mildly), animal lovers will be pleased to note that the bunny and the goldfish in "The Mask" are restored to life and the fish are immediately re-homed. The exact fates of most people in the play are unrevealed, though heavily implied to be awful. Hildred apparently sent a blackmailed client to kill Hawberk and Constance. We don't know what happened there but both seem to be alive at the end. Of course Hildred being not exactly in touch with reality we can't even be sure he actually sent the guy. Bad People Abuse Animals: The Repairer has a cat he constantly taunts and mistreats to laugh at when it lashes out at him violently. Berserk Button: The narrator becomes particularly agitated when people mention his time in an asylum or refer to him as crazy. Cats Are Mean: The title character not only almost lives in fear of his, but also seems to enjoy it. It may have just realized its owner was a psychopath. Spanner in the Works: The evil scheme is foiled by the title character getting his throat torn out by his own Right-Hand Cat. Then again, since most people involved were insane, the plan might not have worked anyway. 20 Minutes into the Future: Chambers' "utopian", reformed United States in the far-off year of our Lord... 1920. Through the Eyes of Madness: The narrator is definitely not stable. Unreliable Narrator: We don't even know if the Crapsaccharine World is real or not; the tales featuring the King in Yellow play are interconnected, but this is the only one which explicitly depicts such a world. The unreliability of the narrator is first touched upon when his cousin calls out his diadem in a safe for what it is: a brass costume crown in a cardboard box. We Will Have Euthanasia in the Future: "Government Lethal Chambers" are introduced so that any citizen who desires it can end their lives. Death of the Hypotenuse: With Genevieve's revival at the end of the story, Boris's suicide seems to be this, as she and Alec are free to be together. The real question is, can they get past their shared trauma and guilt? Driven to Suicide: When Boris find that Genevieve has been turned to stone, he shoots himself. Love Triangle: Boris and Alec both love Genevieve. She confessed she loved Boris more and married him, though she reveals during her fever that she has realized she loves Alec more and wishes she had chosen him. Taken for Granite: Boris's compound turns any living entity immersed in it into marble. He is starting to experiment with animals...and then his wife falls into the pool of solution. By the end we find out that, while it takes years, it eventually wears off. Unobtainium: "The Mask": A newly discovered element tentatively placed in the Incredibly Awesome group. Wax Museum Morgue: It begins innocently enough with turning flowers into marble... and then goldfish... and then a rabbit... and then, quite by accident, a woman. What Happened to the Mouse? : Animal lovers will be pleased to note that the bunny and the goldfish are restored to life and the fish are immediately re-homed. How long be crying—'Mercy on them.' God! Why, who art thou to teach and He to learn?" * All Just a Dream: After his harrowing flight from the organist, the narrator wakes up back in the church pew, with his neighbors glaring at him for dozing off during the sermon. Anguished Declaration of Love: Tessie confesses her love for the narrator in such a fashion. Together in Death: Well, madness, but it works out to the same thing. Once Tessie goes insane from reading the play, the narrator despairingly picks it up and reads it too. Uncanny Valley: Invoked. The pale hearse-driver in "The Yellow Sign" is constantly described in eerie terms as seeming unnaturally soft and puffy, and people often reacts to his presence with revulsion or fear. For good reason. "The way of an eagle in the air; the way of a serpent upon a rock; the way of a ship in the midst of the sea; and the way of a man with a maid." Death by Despair: Jeanne's grave notes that she died in longing for her lost love. Rescue Romance: Phillip falls madly in love with Jeanne after she rescues him lost on the moors. Time Travel: At the end, the narrator find that the castle he had stayed in was a ruin and the girl has been dead for five hundred years. Were empty as the hollow of one's hand." Chasse à jamais tout dessein." Le ciel qui parle au coeur d'existence future!" With age and Fast, is fainting from the sky." Nous sont comptés comme des jours heureux!"